… When a problem could be allowed to grow bigger and scarier than it could if you saw your body and health with real perspective. Like the weed that’s easy to pull as a little sprout instead of a 4-foot tall monster. Imagine catching a malignant tumor in your aging parent when it’s the size of a pea instead of the size of a grapefruit. Or the cartilage tear or disc problem that’s only minor in annoyance instead of something that debilitates you on a daily basis. Yeah, this is worth cursing about. Reddit said this about giving two shits. Which brings us to your health insurance company. 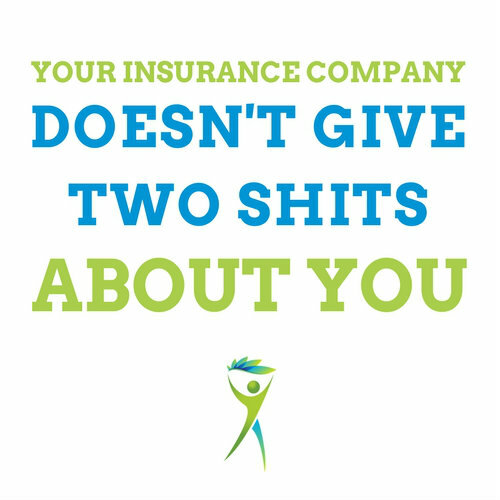 Your health insurance company doesn’t give two shits about you. A doctor colleague of mine received a brochure from his PCP about changes to his insurance benefits. the dosage of his medication has to change (even if it’s because his blood pressure went up or down). his blood markers need to be checked. any new medical problem is discussed. I’m all for preventing cancers, heart attacks, and haunting pains. What if, the doctor finds something? It’s going to cost you. Insurance isn’t covering it. What if, you want to discuss a new problem? In our office at Barefoot Rehab, we consult with anyone about their injury/condition for FREE. Email scheduling@barefootrehab.com or call the office at 862-205-4847 to schedule your consultation and discuss your annoying, frustrating pain that isn’t going away. Give a Report of Findings. The right treatment for the right diagnosis results in pain-relief, no matter if you’ve had pain for months or years or if you’ve been to 3-5 other doctors or therapists without relief. It’s just like finding a nail and getting your trusty hammer to nail it in. What most doctors do is use one tool (a screwdriver) and use it for nails, screws, and nuts. Still, seeing us or any other doctor is going to cost you. Your insurance company will pretend to have your best interest in mind. You will be paying $1,000’s per month, expecting to get high quality care from your in-network provider, and receive no or only temporary relief. Rather than flushing your money down the drain (or better yet, fattening the pockets of the insurance companies that don’t care about you), wouldn’t you rather your money go directly to the doctors who are actually fixing you? More and more doctors are only taking cash (Time). Patients are appreciating the transparency and results-oriented goals of doctors who promise healing and relief. In return, those doctors love growing their practice by making their patients as happy as possible with their care and growing a massive list of testimonials (Google Reviews | Facebook Reviews). At Barefoot Rehab, we accept cash payments or out-of-network benefits. The reason why we are not in-network is because we do not want insurance companies to dictate care based on their rules and guidelines. We’ve seen enough patients ride the Medical Merry-Go-Round that the thought of riding it ourselves makes us want to throw up. We even tried going in-network in the spring of 2017 and found that our doctors and staff were spending 10 or more hours per week fighting the insurance companies, sending in our clinical notes, only to get denied completely or reimbursed as little as $10 per treatment. I travel to Chicago or Boston 6-12 times per year for Integrative Diagnosis training, spending $20,000-$30,000 per year on my continuing education! How am I supposed to be the best doctor possible when I’m arguing on the phone with insurance companies who string us along with lies. I would rather be spending that time serving my patients with top quality care than on-hold for 20-30 minutes waiting to speak with an insurance representative who knows nothing about my patient’s condition nor cares about them getting better. With that $10 check, I might as well have wiped my … nevermind. There isn’t even a diagnosis code for fascial adhesion. So if we played by their rules, NONE of the patients who we’ve helped over the past 7 years (or that we’re currently helping) would have gotten better and we would not have received payment from ANY insurance companies. According to the Time article, it’s not just the wealthy who are seeking out cash doctors. Nowadays many of the people seeking cash-based care are middle-class Americans with high-deductible insurance plans. Proponets of the free-market system for healthcare note concerns for low-income individuals who need care. Just like we do at Barefoot Rehab. If an individual honestly needs the care and shows that they’re working and doing the best they can to receive income, we’re completely open to having a conversation about discounting our already fair rates of $75 per treatment. The insurance companies just want to keep as much of their money as possible. According to my colleague’s PCP, the government is helping them do it. We all must advocate for ourselves. And when we see any healthcare provider or doctor, we have to know what results we expect to get from seeing that doctor. If you don’t give two shits about your body and see the doctor who isn’t rewarded for getting as many people out of pain, what do you expect? Sure, you can choose the chiropractor near you. Many of our patients started with this. Rather than permanently getting out of pain as quickly as possible, their local chiropractor or physical therapist kept them coming back for as many visits as their insurance company would allow per year, year after year. Interesting that the insurance company gets to dictate how many visits you need to get better and not your doctor. Are you ready to get out of the pain you’re in and prevent it from coming back in the future? Maybe it’s time to ditch the in-network providers. What has your experience been with your health insurance? Is your monthly premium worth it? Have you considered getting the highest deductible plan possible to lower your premium as much as possible for emergencies, then paying cash for all non-covered services?